The Graduate Climate Conference (GCC), now in its twelfth year, represents a rich tradition tied to the history of the PCC. First held in 2006, the GCC has grown and evolved while remaining true to its core mission of highlighting student-led work at a conference run by graduate students for graduate students. Hosting responsibilities have alternated each year between students in the PCC at UW and students from the Massachusetts Institute of Technology (MIT)’s Program on Atmospheres, Oceans, and Climate. 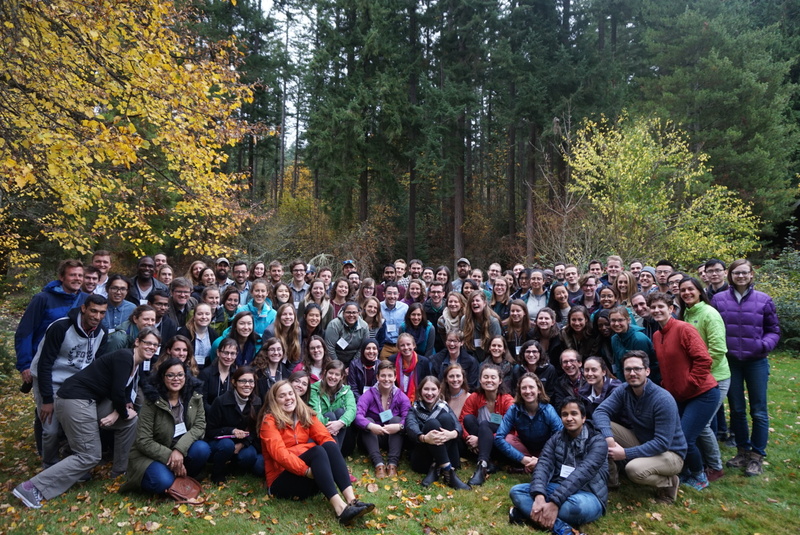 The 12th annual Graduate Climate Conference was held on November 2-4, 2018 at the Pack Forest Conference Center. The event featured almost 120 participants, a marked expansion from past years made possible by generous support from the National Science Foundation, PCC, and other sponsors at UW (for a full list of sponsors, see the GCC website). The larger size of the conference this year made it possible to accommodate a wider spectrum of climate-related disciplines. An unprecedented number of travel grants were offered to both U.S. and international attendees. Additionally, a new GCC Code of Conduct was adopted this year in order to encourage a safe and respectful environment for all attendees. Women comprised about 58% of attendees in 2018. The conference program featured seven sessions of student talks and poster presentations, summarized below, as well as a keynote presentation from Heidi Roop (UW Climate Impacts Group) entitled, “Imagining a new climate science ‘ecosystem’”. For the first time at a UW-hosted GCC, students had the opportunity to attend one of three enriching workshops on science communication (led by UW Engage), climate justice (led by the UW Academic Student Employees’ Union, UAW 4121), and public comment on federal regulations (led by the Public Comment Project). Additionally, social activities during the weekend included a Halloween costume party, hike on Mount Rainier, and city and brewery tour. Meals and refreshments were provided by Pack Forest. Session 1, “The Human Side of Climate Change,” was chaired by Alex Stote (UW) and Rose Palermo (MIT). The poster session featured work on energy production and conservation, vulnerability and adaptation, migration, cultural heritage, and other topics. In the oral presentation session, Kellon Bubb (Howard University) opened the conference with a talk on climate communication and mitigation in the English-speaking Caribbean, raising questions about how communities facing similar climate impacts can share information and strategies. Thomas Timberlake (Colorado State University) examined how the National Forest Service is incorporating climate change vulnerability assessments and resilience into planning and policy, using examples from parks in Montana and Washington. Seth Wynes (University of British Columbia) challenged the audience to reflect on their own carbon footprint while presenting findings on how often researchers fly and whether their travel patterns can be linked to career success. Lastly, Cascade Tuholske (University of Santa Barbara) examined which socioeconomic factors can predict future food insecurity in West Africa, shedding light on the inequitable impacts of climate change faced by different regions. Together, the posters and oral presentations in this session emphasized the need for continued research on how humans can collaborate to find innovative solutions to communicate, adapt, and mitigate under climate change. Session 2, “Atmospheric Sciences: Means, Extremes, and In-Betweens,” was chaired by Casey Hilgenbrink (UW) and Katerina Gonzales (Stanford University). The poster session highlighted research on ozone pollution, Arctic energy balance, storm tracks, heat waves, and a variety of other subjects. In the oral presentation session, Moyo Ajayi (Vanderbilt University) explored the sources and fate of methane emissions from caldera environments, such as those in Yellowstone National Park. Bor-Ting Jong (Columbia University) presented on the ability of El Niño-Southern Oscillation (ENSO) to affect North American climate through atmospheric teleconnections. Catherine Wilka (MIT) discussed recent variations in ozone depletion, with an eye to our ability to detect recovery trends amidst natural background variability. Finally, Megan Lickley (MIT) examined what factors influence changes in global aridity, and how these changes will impact human populations. In all, the research presented in this session highlighted the dominant role of the atmosphere in controlling climate conditions relevant to humans, as well as the capacity for anthropogenic changes to modulate those conditions. Session 3, “U.S. West Coast Climate and Policy,” was chaired by Ashley Bagley (UW) and Sonali Abraham (University of California, Los Angeles). The poster session featured work on climate risk to river flows, weathering hazards, and urban water conservation. In the oral presentation session, Kyra Freeman (Western Washington University) discussed the effects of climate change on the Stillaguamish River Basin, including impacts on salmon habitat. Katie Keil (UW) considered changing ocean conditions in the context of priorities for natural resource managers. Daniel Feinberg (UW) explored hazard mitigation plans in Washington state and the importance of stakeholder involvement in their creation. Ryan Barr (University of California, Davis) presented on optimization of California’s electricity system for new renewable energy technologies aimed at climate change mitigation. Overall, the range and depth of the presentations in this session emphasized the need for continued interdisciplinary climate research, and demonstrated how effective policy can be informed by science. Session 4, “Paleo Perspectives,” was chaired by Jessica Badgeley (UW) and Nora Richter (Brown University). The poster session included work on new proxy development, climate model data assimilation, and climate influences on past human civilizations. In the oral presentation session, Steph Gruver (Northern Illinois University) explored how changes in Pacific climate patterns influenced Peruvian civilizations 12,000 years ago. Rachel Lupien (Brown University) went deeper back in time to examine how climate change over the past four million years influenced human evolution in east Africa. Stephanie Arcusa (Northern Arizona University) brought climate change closer to home, analyzing dust records in the San Juan Mountains in Colorado to understand the frequency of droughts in the Midwest. Benjamin Birner (University of California, San Diego) concluded the session by discussing the development of a new noble gas proxy to track warming in the ocean. While presentations in this session emphasized limitations in our ability to reconstruct climate on shorter timescales and interpret proxies that are vulnerable to unwanted biological and environmental influences, the presentations also highlighted significant progress in understanding long-term climate changes and their role in human civilization. Session 5, “The Changing Blue Planet,” was chaired by Sarah Ragen (UW) and Jennifer Genzer (Texas A&M). The poster session showcased research on oceanographic topics ranging from historical warming reconstructions to controls on phytoplankton productivity to the impacts of oil spills in an increasingly acidified ocean. In the oral presentation session, Piyali Chowdhury (Indian Institute of Technology Bombay) presented future projections of waves along the Indian coast, highlighting how climate change could affect wave height and direction. Liran Peng (University of Alaska Fairbanks) examined the impacts of storms on the future melting of Arctic sea ice, showing that intense storms can accelerate ice melt through enhanced upper ocean mixing and heat transport. Riley Brady (University of Colorado Boulder) spoke about the role of internal climate variability of CO2 fluxes in eastern boundary currents, raising questions about predictive skill with respect to these boundary systems in a changing climate. Heather Summers (University of British Columbia) focused on coral reefs in Kiribati, diagnosing influences on decreased shoreline protection under ocean acidification. Overall, the research presented in this session explored the impacts of climate change on the oceans as well as the ecosystem services they provide for marine life and humans. Session 6, “Ecosystem Responses to Climate Change,” was chaired by Jennifer Hsiao (UW) and Jimmy deMayo (University of Connecticut). The poster session featured work relating climate change to impacts on prairie plants, Kenyan coffee production, coastal sea level rise, Arctic shrub expansion, and a variety of other topics. In the oral presentation session, Spencer Keyser (University of Texas) discussed the effects of climate change, such as those involving precipitation, on avian community biodiversity. Tyler Hoecker (University of Wisconsin–Madison) explored how environmental influences either provide refugia or enhance vulnerability for forest ecosystems that are susceptible to wildfires. Sanjeevi Nagalingam (University of California, Irvine) presented on the biogenic responses of plants to heat stress on land, while Carolyn Wheeler (University of Massachusetts Boston/New England Aquarium) discussed the physiological and developmental responses of sharks to heat stress in the ocean. Altogether, the posters and oral presentations in this session demonstrated the diversity and complexity of responses of organisms and ecosystems to climate change. Session 7, “The Diverse Role of Ice in the Past, Present, and Future,” was chaired by Gemma O’Connor (UW) and Momme Hell (University of California, San Diego). The poster session highlighted research on various aspects of the global cryosphere, including glaciers in the Sierra Nevada, ice shelves in Antarctica, and firn layers in models. In the oral presentation session, Yuzhen Yan (Princeton University) showcased climate records from two-million-year-old Antarctic ice, providing evidence linking greenhouse gases to Antarctic climate since at least the early Pleistocene. Gabriel Lewis (Dartmouth College) presented work using radar and shallow ice cores from Greenland to reduce uncertainty in spatial accumulation rates, which could better constrain the mass balance of the rapidly melting Greenland Ice Sheet. Margaret Lindeman (University of California, San Diego) examined ocean observations from the terminus of Greenland’s most rapidly melting glacier in order to better understanding melt mechanisms and rates. Lastly, Andrew Pauling (UW) used a climate model to test the efficacy of a new proposal to offset declining Arctic sea ice by spraying seawater onto the ice, finding that this proposition could only have worked if we had started years ago. Together, the research presented in this session emphasized that more work is needed to understand the impacts of past and future climates on the global cryosphere.